Thirty years ago, the founder of USAC headed to Italy in search of a new study abroad program. His first thought was Florence because of its rich history and architecture. He quickly learned that more than 40 other study abroad companies had programs there, and it was challenging to get a meeting with the local university. Instead, he decided to go visit a friend that lived in Torino, Italy, and the rest is history. Thirty years later and USAC remains one of the few consortiums to offer a program in this unique Italian city. 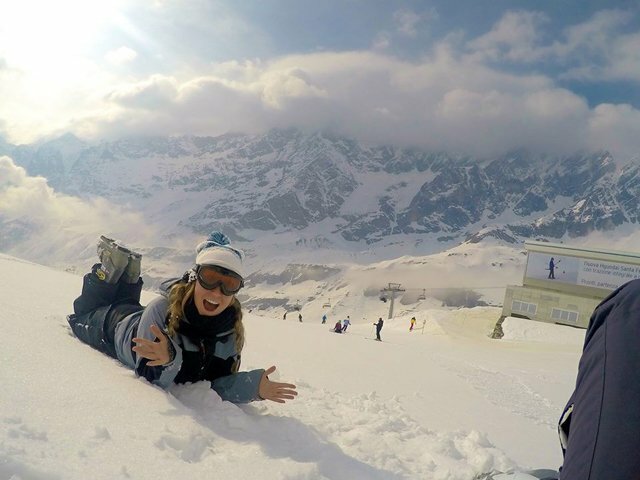 In honor of the 30th anniversary of the Torino program, we spoke with Alyssa Nota, the Resident Director of the USAC Italy programs, about how the program has evolved over the years, some of her favorite memories, and why Torino is an amazing place to study abroad. How has the USAC Torino program changed over the last 30 years? Wow, where to begin?! We have strived consistently (and I believe, succeeded) to stay very linked to our USAC core values – focusing on the well-being of our students and creating high quality, challenging opportunities for them to learn and grow in new and more ways each year. For example, our curriculum has increased to include many courses in international business, politics, communication, architecture, and Italian language. Internships, volunteering, and interaction opportunities with local students and in the community have grown greatly over the years as well. In the early years, the groups were about 10 students, and now they reach over 70. 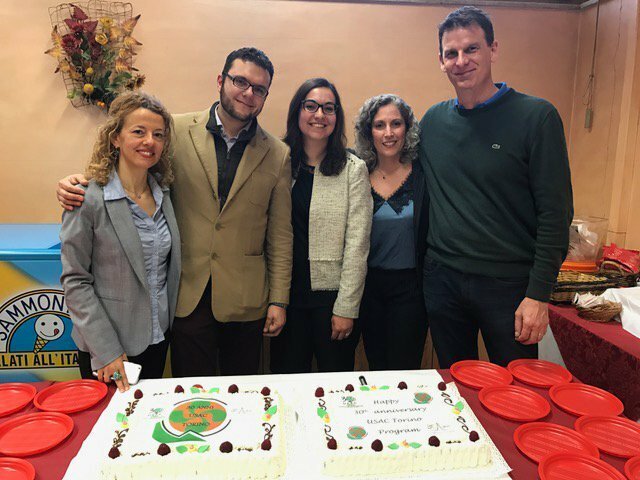 We are also fortunate to have maintained a positive relationship with our host university, SAA (Scuola di Amministrazione Aziendale)-University of Torino- this year SAA celebrates 60 years while we celebrate 30 years — a good, long term partnership! How have the students changed over the last 30 years? They have definitely become much more technologically focused and savvy. 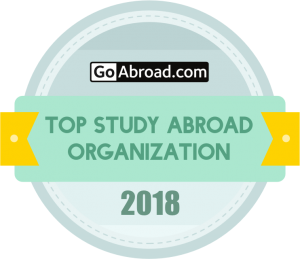 In effect, the world has gotten smaller and faster as a result of this attention to technology, social media, etc… but luckily more and more students are learning about study abroad and participating in it as a result! 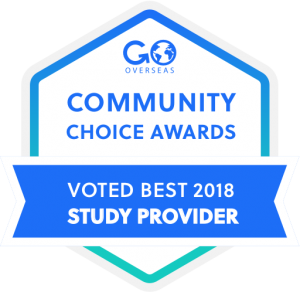 USAC is a perfect choice for students looking for authentic, affordable options abroad. What are some of your favorite memories from the last 30 years? Favorite trips? By far one of the greatest moments in the recent history of the program and city was the 2006 Winter Olympics in Torino. It was a time of excitement, joy, pride, and strong international spirit in the city. The city really put on its best show, and the pride of the citizens still remains today – over 11 years later. We had about 100 students that semester in Torino (and many more who applied — which is one of the reasons why we opened the Viterbo program that semester too)! The USAC students attended a lot of the Olympic events and many got to do internships, volunteering, and to interact with the athletes and international guests. Some even worked with the US Olympic team! Staff and students appeared in the audience of the Today Show which was filming in Piazza San Carlo in downtown Torino, and it was common to run into famous broadcasters and athletes on the streets just walking around. A personal favorite memory was attending the Opening Ceremony and hearing Luciano Pavarotti sing live! A truly Italian experience! The stadiums and facilities built for the events are still being used today for sports, music and cultural events — and USAC students go ice skating each winter in the Palavela facility which is right next to our school! 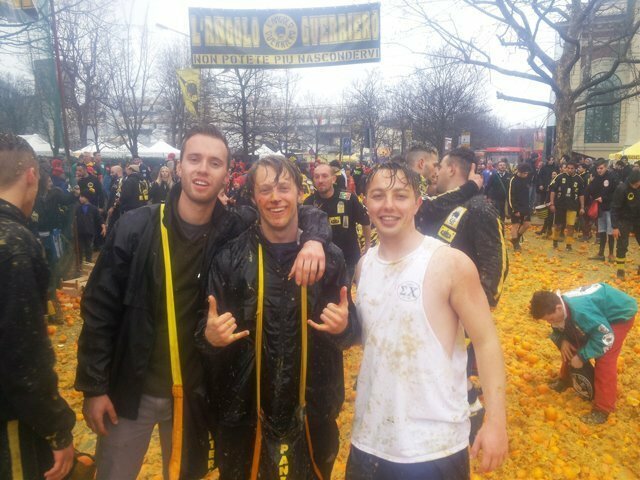 As far as ongoing events, a favorite trip that we organize each spring is the IVREA orange-throwing battle – which dates back to medieval times – and is still a wild day of fun for students and staff. It is a very messy day — but the students always say it the best field trip of all time! Some have even come back again the next year to do it again. Another favorite trip is always the Italian Riviera — which we do three times a year because of the great student response we always get. We go 2 times in summer and 1 time in the Fall. We stop in Genova, Santa Margherita Ligure and Portofino — all beautiful and interesting coastal sites. Students often add on a trip to Cinque Terre while there .. a short train ride away (about 30 minutes). Hiking, swimming, strolling, eating, shopping … what could be better? 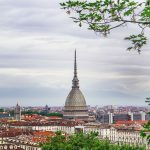 What is your favorite part about Torino? Why should students choose to study there? Torino is unique in Italy because it is a large city with so much to offer — but has remained off the tourist path all these years. This means it remains an excellent, authentic Italian city and place to study — without being overcrowded by tourists or American schools. It is large enough to find just about any kind of food or shop, but each neighborhood is special. Students can quickly make local friends and become a part of the neighborhood (like at their favorite corner cafe or gelato shop!). I particularly love that Torino is modern and ancient at the same time — I love walking on the Roman-era cobblestone streets in the Quadrilatero area, but also admiring the elegant 18th and 19th-century palaces and seeing the super modern skyscrapers going up! 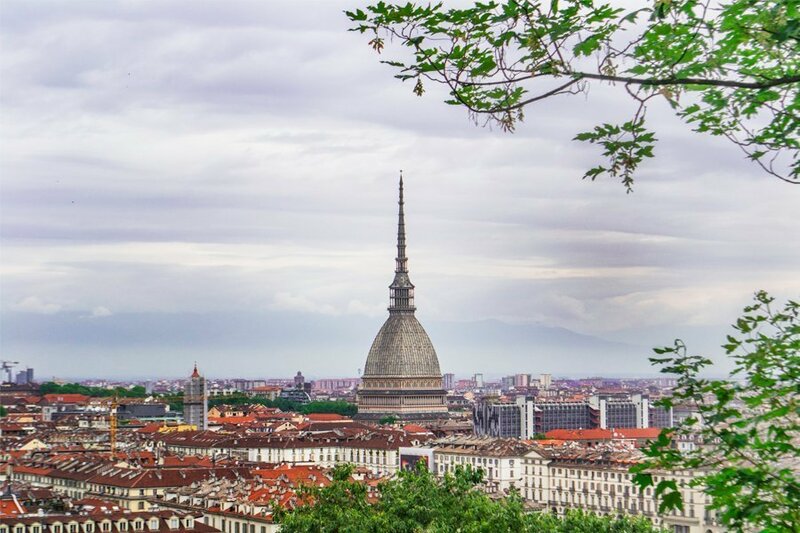 Having the Alps as a spectacular backdrop makes Torino even more special. And when (if) you want a brief change from the city life, you can be in the mountains or at the beach in about an hour! Can you list some hidden gems in Torino? Some spots that are not so well known but are well worth a visit are: Parco Valentino. a long, huge park along the River Po – from behind our school down to the city center — includes paths for walking, jogging, biking, areas to play sports, have a picnic, stop at cafes and small restaurants inside the park… there are even famous architectural gems in the park like Valentino Castle (where the Architecture dept. of Univ of Torino is based) and Borgo Medievale (a unique mix of medieval-style castles, shops, workshops and gardens built in 1884). We visit here with our art history classes! Beautiful bridges cross over the River throughout the city — and are illuminated at night — it’s beautiful to see the lights and to watch the rowers go by along the river. Another special part of Torino are the Christmas lights that shine in the city from early November to early January each year. Artists compete each year to show their creative light creations and each year the previous winners are on display along with the new. So by now, there are many throughout the whole city — adding a very modern-art feeling to the city during the holiday season. If you’re interested in learning more about the USAC Torino program, visit our website. I went in 1999. Amazing time and experience! Beautiful city with amazing food. I am still in touch and talk with some of my Italian, Spanish, and American friends I made there. I wish I did a year rather than a semester.